Rogue REDEMPTION ALERT! I railed pretty hard on Dead Guy a while back; I'm not ashamed of that, but I do think they've redeemed themselves on this one. If this were in every sushi bar in America, Sapporo and Kirin would be out of business. There's an interesting starch-like quality to this with just a hint of citrus. 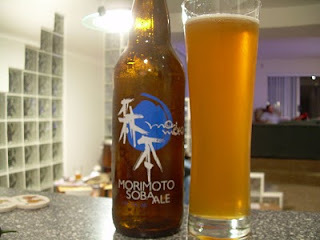 The finish is minimally intrusive, meaning you could enjoy this (a) en masse, or (b) as Sake bombs. Yeah BRO!!!! The only strange thing is the 9 ingredients in this, and about 7 I have no clue what they are. So maybe this is a genetically engineered beer or a super secret samurai drink; either way I'm happy. Wikipedia challenge of the next 5 minutes: Just what is soba, and who is Chef Morimoto?